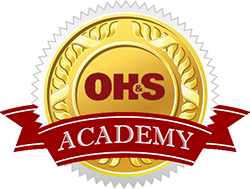 Whether you're an experienced health and safety professional or new to the industry, OH&S Academy has the training you need to stay up-to-date on the job. At only $99 each, our 90-minute online courses are designed to fit your schedule and budget. OH&S Academy offers new-, intermediate-, and advanced-level courses throughout the year. These training courses are designed for safety managers, HR directors, and top executives: "The New Safety Professional's Toolbox" courses will help safety professionals with minimal experience achieve compliance and recordkeeping goals and meet the challenges of an OSHA audit; intermediate-level courses, for professionals with 2-10 years of experience, cover human resources for hiring good employees and staying compliant, return-to-work programs, and instilling an effective safety culture; advanced courses will teach senior safety and HR managers and C-suite executives how to prevent soft-tissue injuries, which are a significant problem for aging U.S. workforces, and how to move toward global-class safety performance and culture. In this OHS Academy webinar, Greg will provide an introduction to silica (what silica is, where it can be found, its uses), review the nature of the hazard and potential disease outcomes, provide an overview of types of operations with potential exposures, share an update on regulatory status, give an overview of requirements of the standards, share some practical implementation considerations to include for air sampling (exposure assessment) and engineering controls.